Kelechi Iheanacho’s screamer against Tottenham in Sunday’s spectacular nine-goal thriller has been nominated for the goal of the weekend. The English Premier League’s official media partner, Sky Sports, pitched the Leicester City Forward’s 47th minute goal against three others including Harry Kane’s goal in the same match. It was only his third league goal of the season, but it was a remarkable strike from the Nigeria international. 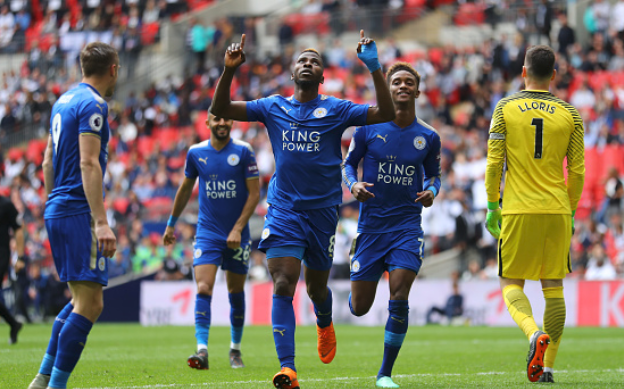 Iheanacho went shoulder to shoulder against Kenya and Spurs man, Victor Wanyama; eventually shrugging the rugged midfielder off, as he ran through on goal before belting a 20-yarder with his left foot. His shot veered past Hugo Lloris, giving the Spurs goalie no chance at all as the shot struck the top right angle of the net. It ended 5-4 in favor of Tottenham, who played their final game at Wembley.